Selling Your St. George Area Home? Why use Vista Real Estate St. George to in the selling process? Experienced: Between 5 agents - we have over 100 years combined experience! Connections: Full-time agent in the St. George, Utah real estate community with a large list of buyers and sellers. Service with Results: Start to finish assistance, helping you sell your southern Utah property for the highest price and best terms. Knowledgeable: Expert southern Utah real estate area knowledge. You'll notice the difference with Vista on our first appointment to discuss your property in St. George. We don't believe in high pressure deals - we find out what you want for your property and discuss values based on a market analysis. For the CMA, we use the most up to date comparable homes and properties in St. George and southern Utah. We have a very simple listing agreement that we'll discuss and answer any questions you have. Then it's time to put in on the multiple listing service in Washington County. With the local market conditions and styles - we will walk through your home and discuss options to make it look the best it can. Sometimes this can mean removing certain furniture to open the space, simple repairs to be made prior to market, or a quick painting of an accent wall done by our in-house handyman! We want to make sure you get top dollar for your southern Utah home or property. St. George, Utah real estate market is hot and you can capitalize on this if you have the right advice to show your property at it's finest. Your motivation will determine a lot of the pricing we recommend. If you're looking for the fastest possible sale you might want to consider putting your St. George home on the market at slightly under anticipated appraisal value. If you're comfortable with a little more marketing time we can try a little higher than market for a time and test the waters. With our experience and network of agents - your home will sell fast. 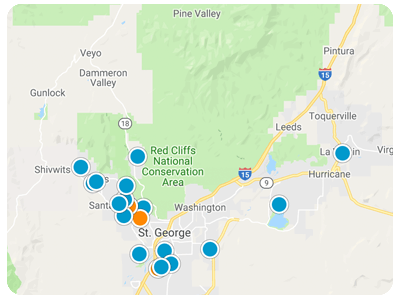 We have a large database of buyers actively looking for homes in nearly every southern Utah area and every price range you could imagine in St. George. Our plan includes: Aggressive marketing through our site, Realtor.com, Zillow.com, Trulia.com, Yahoo.com and many others. Of course, this doesn't always do the trick. So we also do the conventional real estate listing techniques such as open houses, flyers, Realtor tours for St. George real estate agents, newspaper ads, and more. We do everything we can to ensure you get your home sold in the timeframe you want with the best possible price. We handle everything! We do all the paperwork and get all the signatures required by Utah real estate law. We help you find the best title company to facilitate the closing and we are there the entire way. If you're local we will attend the closing with you and answer any questions. If you're not in the St. George, Utah area - we will be on the phone with you while you sign and assist. We know who has the lowest closing and settlement fees in southern Utah and we'll help you save money! It's moving day! We can also help arrange movers and cleaners so you don't have to hassle with the move out!